Lovcen is the perfect day trip into the mountains from Kotor Bay. Take your kids, a picnic and explore one of Montenegro's most accessible national parks. 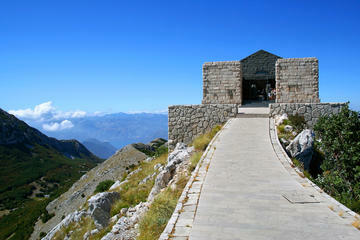 Lovcen is one of the most popular national parks of Montenegro. It lies between Kotor, Cetinje and Budva and is an easy day trip from anywhere on the coast. The route via the serpentine road up from Kotor is one of the most scenic in the country and will give you stunning views of the Bay of Kotor all the way. 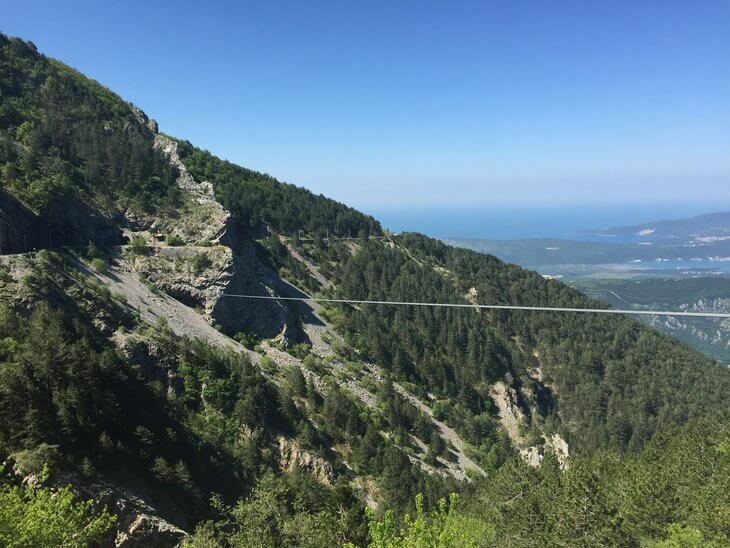 It does have 25 hairpin turns, so you’ll want to take it a bit easy… but this probably won’t be a problem as you’ll be wanting to stop so often to take photos of the view! 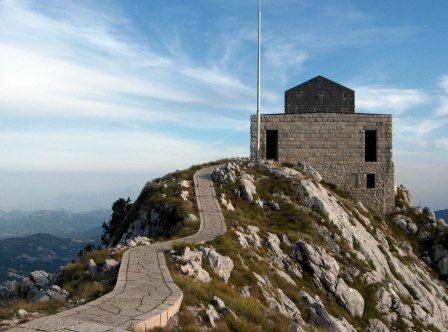 Lovcen National Park is popular getaway for Montenegrin families in summer. Because of the altitude, the temperatures here are around 10 degrees lower than on the coast and coming here is a great way to get a break from the summer heat. The national park covers 6,220 hectares and two thirds of that is covered in forest. Like Lake Skadar, the park is an important reserve for many of Montenegro's native bird species. It's home to around 200 species of bird which include falcons and eagles. It's also home to a number of bears and wolves... but you'd be very unlikely to spot any of those. They tend to stay in the most remote parts of the park where there aren't any people. Lovcen is best known for housing the mausoleum of Montenegro’s favourite son, the poet, bishop and leader Petar Petrovic Njegos. You can visit the mausoleum via a long staircase of 461 steps and you’ll also be rewarded here with 360 degree views of the surrounding mountains for your efforts. 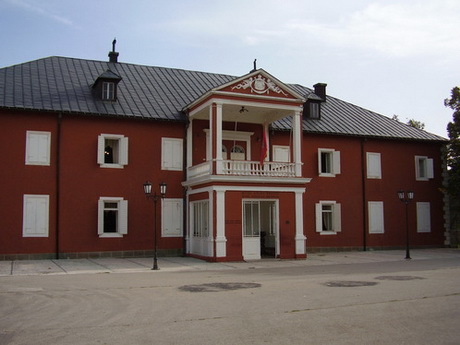 You can also head over to Negusi and visit the museum which is in the house Njegos was born in. Njegusi is a little village on the way to the national park. Njegusi is famous for being the birthplace of Njegos, but it's also famous for its proscuitto ham and smoked cheeses. 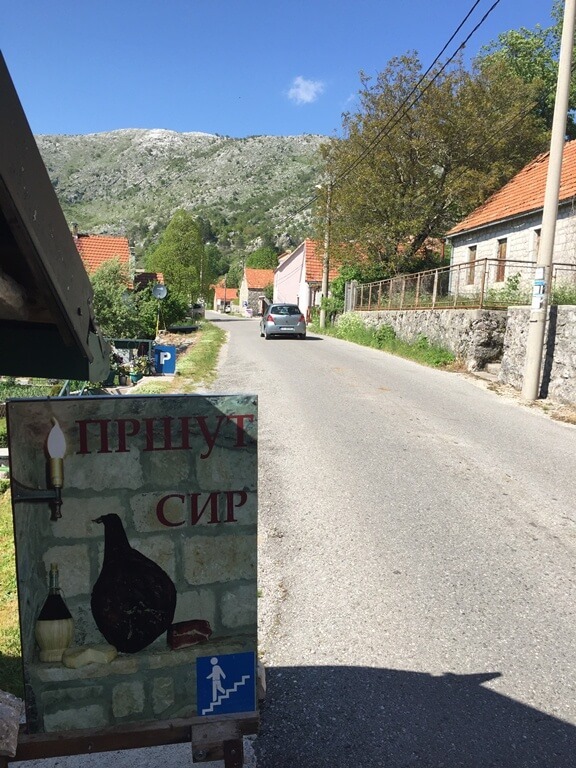 As you drive through the town you'll see signs and stalls offering tastings and sales of ham, cheese, honey and rakija - the local brandy. Just before you reach Njegusi, you'll come to zipline crossing the canyon between curves in the road. There’s a visitor’s centre at Ivanova Korita where you can get information and pick up maps for walking trails. You’ll need to keep in mind that there is generally snow up here from November to April and temperatures can be substantially cooler than down at sea level. You can hire a guide from the visitor’s centre if you want to do a guided walk. To do this you’ll need to book in advance and you can contact them at nplovcen@nparkovi.me. 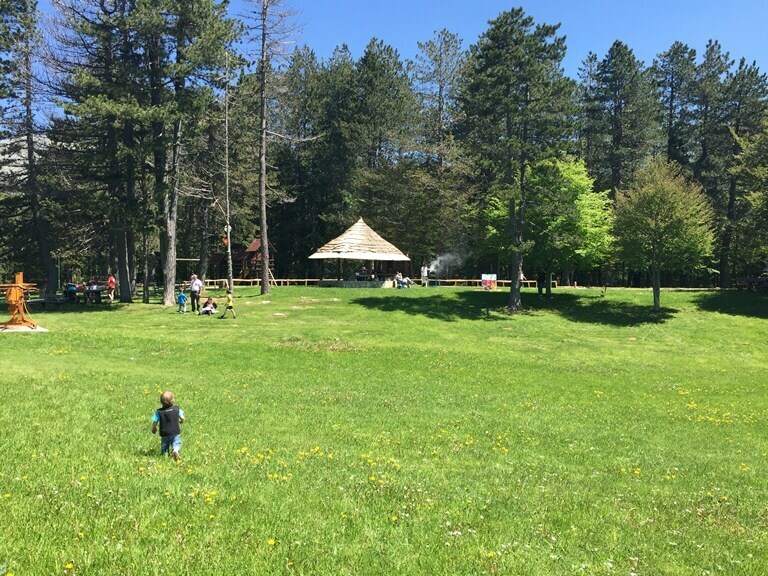 Ivanova Korita is a great spot for lunch, a picnic or a game. There's a big open field that's ideal for ball games. There's also a children's playground and barbecues for grilling. 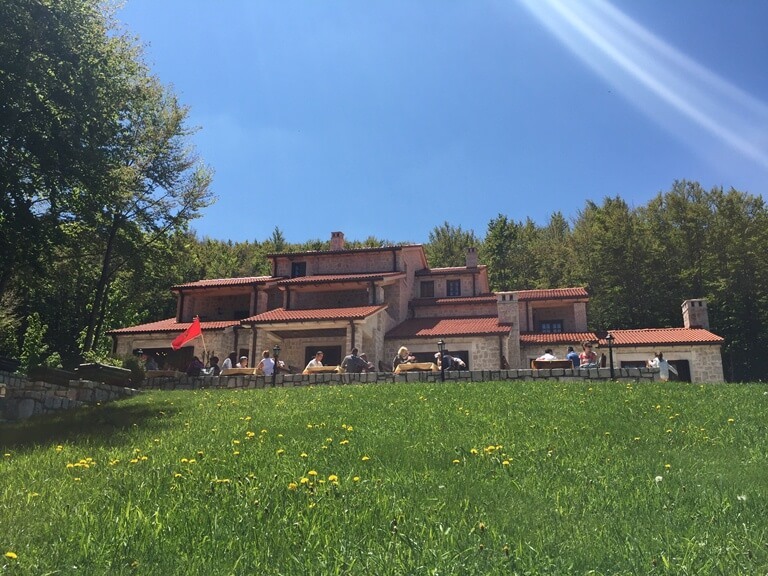 If you don't feel like barbecuing or bringing a picnic, head over to Ivanov Konak which has an excellent restaurant and a lovely hotel called Ivanov Konak. You’ll also find a ropes course here that has difficulty levels for everyone. You can hire bikes from the visitor’s centre at Ivanova Korita for €2 an hour or €7 per day and explore the trails and park this way. This day tour to Lovcen and Cetinje is a great way to see the Budva Riviera and Lovcen in a short time. You head along the riviera up to Cetinje and visit King Nikola's court and Cetinje Monastery. Then you continue on to Njegos' mausoleum in Lovcen National Park. There's a hike up 461 steps to get there, but at the top you'll get views of Montenegro, Croatia and Bosnia and Herzegovina. You return to Kotor via the scenic serpentine road which gives you stunning views of the Bay of Kotor. On this tour you take a private transfer up the serpentine road to Njegusi, where you can try Njegusi parma ham and cheese. Then you head onwards to Cetinje, the old royal capital of Montenegro and visit Cetinje Monastery. From there you visit Petar Petrovic Njegos’ mausoleum in Lovcen National Park before returning to Kotor. If you've got a rental car, you can easily take yourself on a self-drive tour to Lovcen. If you'd prefer to do more sightseeing, you can build in a stop in Cetinje, Kotor and Budva too. Drive up the hill above Budva towards Cetinje. There are places you can stop along here to take photos of the riviera. You'll get views all the way from the old town past Sveti Stefan. Once in Cetinje, visit King Nikola's court, the national museum and Cetinje monastery. Continue on to Njegos' mausoleum, climb the steps and visit the mausoleum. Stop at Ivanova Korita for a walk and late lunch in Ivanov Konak. Head back down the serpentine road to Kotor, stopping in Njegusi to pick up some proscuitto and cheese. A private tour with a knowledgeable local guide who'll take you up to Lovcen and Cetinje to see the historical former capital city and national park. Then you have a choice of accommodation for the night, choose from a hotel, apartment or tenting. The second day, you'll drive up to Vrmac Ridge to do some more off-roading and get panoramic views of Kotor and Tivat bays. 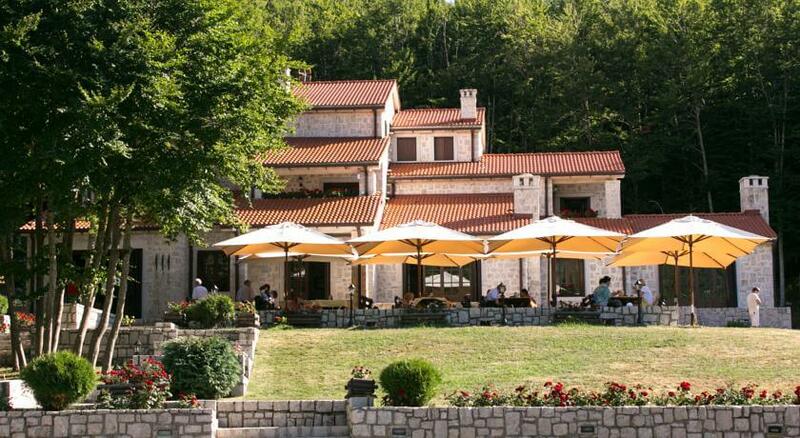 Ivanov Konak is a lovely hotel restaurant in the heart of Lovcen at Ivanova Korita. It's a lovely place to getaway in peace and quiet for a few days. The park, barbecues, green space, walking and biking trails are all on your doorstep. You can rent bungalows that sleep 4 inside the park. These cost €40 per night and you can book them by emailing nplovcen@nparkovi.me. Again, email nplovcen@nparkovi.me for reservations. The nearest town to Lovcen National Park is Cetinje. You could stay here for a night if you were touring around Montenegro, but I wouldn't recommend basing yourself here for a week's holiday. Cetinje is an interesting town to visit, but you won't find nice hotels or many things to do for tourists. You'd be better to choose accommodation somewhere along the coast or at Lake Skadar if you like a holiday with lots of outdoor activities.